Many nice features like the iGrill system. Cooks consistently and burns at a good temperature. 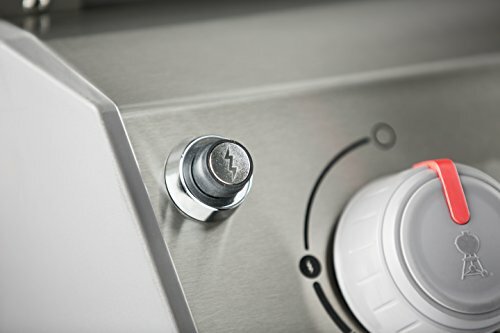 The Weber Spirit II E-310 is a three burner grill with a series of modern features all built around a central design that emphasizes ease of use and comfort in your grilling -and unlike the last iteration of the Weber Spirit, this grill has the control knobs placed to the front, freeing up more of the side shelf space. The Weber Spirit II comes complete with the GS4 grilling system. This means you will be looking at E2i igniters, high-performance burners, a grease management system, and a couple other nice add-ons we will touch on in a bit. There are also iGrill capable connections should you opt to purchase the iGrill thermometers and cooking products. 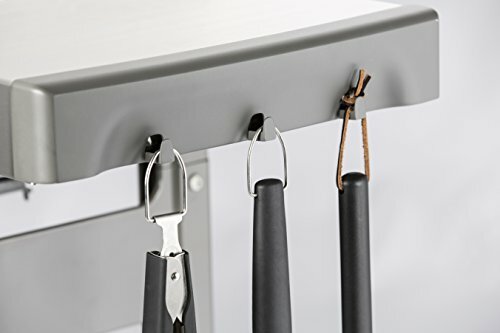 The grilling cart is an open design and helps make the best of the tool hooks, extra shelf space, and side tables. A relatively mobile design with enough space to spread out a little bit once set up. A curious addition is the all-terrain all-weather wheels which give your cart that extra ease of movement on taller grass and other rough terrain. 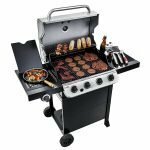 You shouldn’t be expecting to really move around with this grill once set up though – the wheels are barely adequate for what they need to accomplish – luckily this is a tiny blemish on an otherwise fantastically designed grill for both aesthetics and functionality. 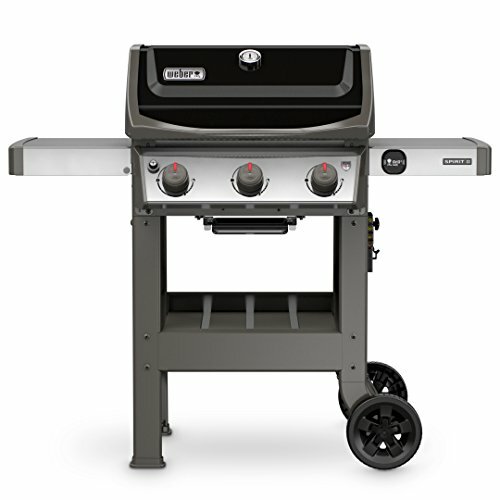 For the actual grilling stats: You will be utilizing around 30,000 BTU’s on 424 square inches of primary cooking space. 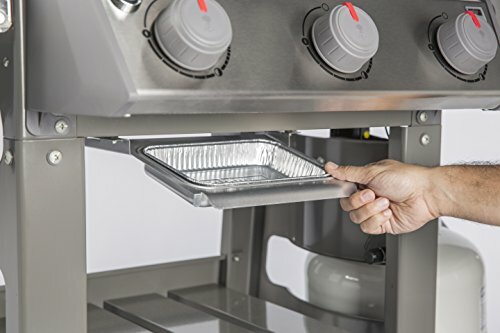 The warming rack is coming in at about 105 square inches, leaving you with a total of 529 square inches of cooking area. The cooking grates are cast iron with porcelain enamel. The instructions are clear, and the assembly is relatively straightforward. You can expect around 90-120 minutes of construction time. 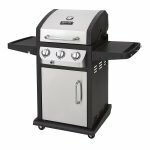 The ignition system is excellent, and the grill heats up quickly and evenly. The grill burns hot and performs well at low temperatures. They put a lot of thought into the design to ensure you are getting quality results. Between the flavorizer bars, quality even heating, optional grill plates and the iGrill tools that allow to accurately monitor internal temperatures- all mean you have a plethora of tools to ensure you cook the meal to your exact preferences. 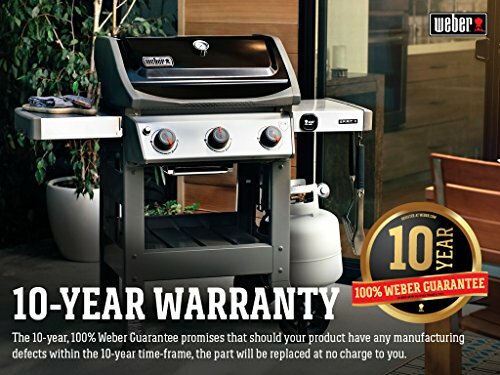 You can definitely rely on this Weber for consistent good tasting meals. You will be utilizing around 30,000 BTU’s on 424 square inches of primary cooking space. Depending on the model you will also have an additional 105 square inch warming rack. The folding side table is also lovely as a space conserver. This is perhaps something worth mentioning here: This grill gives you a substantial amount of grill space to work with but can still be manageable on smaller balconies. Folding optional pieces and an open cart that doubles as more shelf space keep the possible profile size low. The Weber Spirit II E-310 comes with a number of subtle features that work to make this grill a pleasure to use. 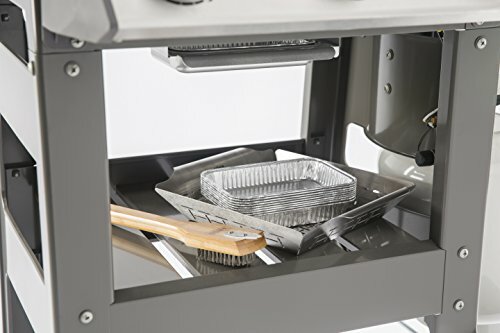 Such features include a porcelain-enameled lid, iGrill options, All-weather wheels, tool hooks, a grease management system and an open cart design. Some of these features are a lot more useful than others, but they demonstrate a real attempt at making a quality all-purpose grill. 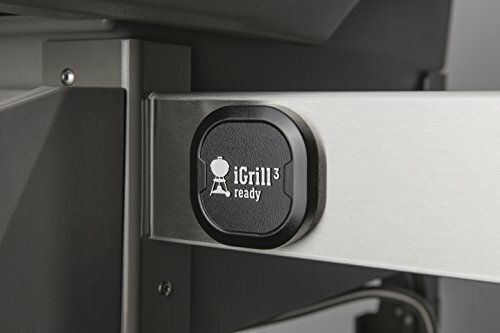 The iGrill 3 system allows you to accurately grill your food with higher precision than ever before. It is mounted directly into your grill and allows you to use your Apple devices to monitor the status of your food – up to four individual cuts of meat. It will even let you know when the food is done to your set parameters. 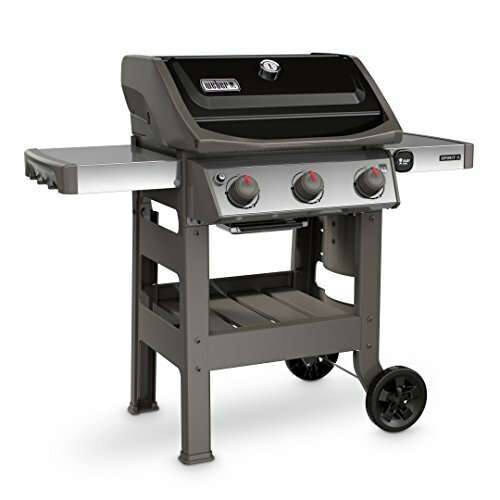 The GS4 high-performance grilling system is a significant improvement over previous iterations of the series. 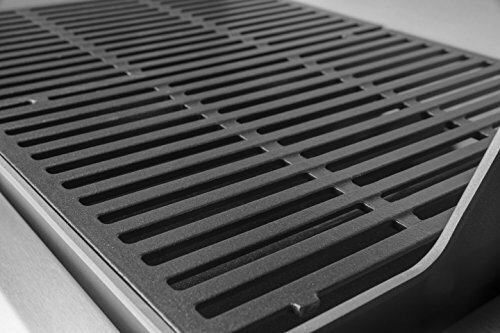 The GS4 system has four main elements that make up the offering: the first is the E2i Ignitors which allow you to fine adjust the surface temperature of your grill instantaneously. The second central aspect are the improved burners. The GS4 burners are designed around being able to endure intense usage over long periods of time without showing signs of wear. The ability to withstand extreme heat is vital since these burners can put out a substantial amount of BTU’s. 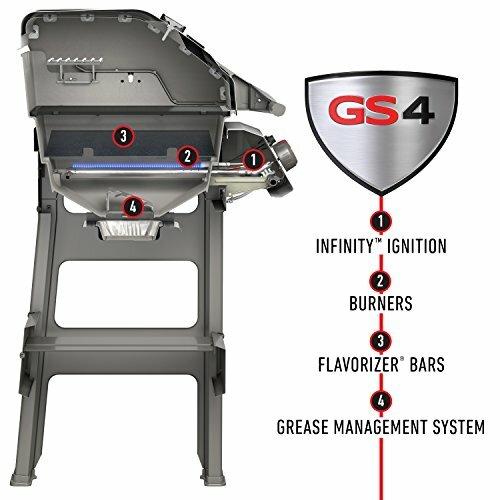 The third element of the GS4 series are the “Flavorizer Bars” these bars not only reduce flare-ups – they also work to evaporate drippings, which works to imbue your food with a rich, smoky flavor. Last of the four major GS4 features is the grease management system which we will look at in the next section. The E-310 has a decent grease management system thanks to the GS4 package that will help you avoid grease fires and buildup. 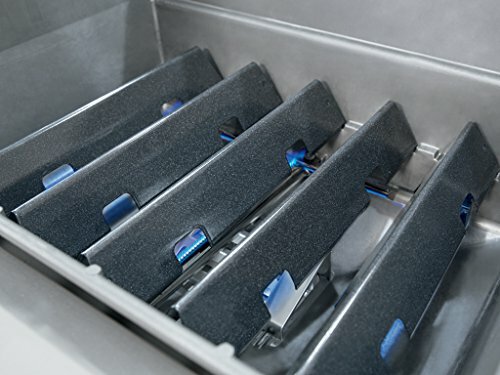 Any grease drippings not vaporized by the flavorizer bars will be efficiently transferred into the removable drip tray. Outside of that, and the porcelain coating on the grill, cleanup will be a standard affair with the grill. The drip tray is a snap to remove and replace. The Grease Management System helps with the removal of grease while reducing the risk of ﬂare-ups. Drippings that are not vaporized by the Flavorizer Bars are funneled away from the burners into the disposable drip tray, located under the cook box. Just remove the drip tray, and replace it as needed. You will get a standard 10-year warranty for all parts. This is nice considering many other companies will only ensure the significant elements of a grill for anything past around 3 years. This speaks well to their confidence in even the smaller pieces of this grill. Solid family sized grill that does a beautiful job on the usual chicken and steak. Convenient, simple and effective. 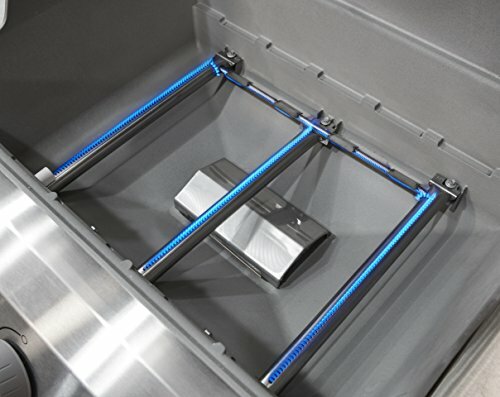 The additional features like the app connection also make this grill a unique and easily justifiable choice. Very sharp heat deflector for no reason. Cramped space for rotisserie and beer-can chicken. No front wheels. Wheels they do have are weak.